El Deafo was the first graphic novel to receive a Newbery Honor (in 2015), and it received an Eisner award that year, too. I Yam a Donkey (Clarion Books, 2014) is a picture book in which a persnickety yam and a goofy donkey argue about grammar. Hilariously, I might add. You is correct in guessing that this book is a favorite amongst English teachers in these here United States about America! Rabbit & Robot: The Sleepover (Candlewick Press, 2013) This easy reader features four things on a list of things to do, three pizza toppings, two friends, one crazy night! This book won a Geisel Honor in 2013! Rabbit & Robot and Ribbit (Candlewick, 2016) again features our friends Rabbit and Robot as they navigate the difficult seas of jealousy. Rabbit invites himself over to Robot’s house, only to discover that Robot already has a friend there—Ribbit! Lots of miscommunication and hurt feelings ensue, but of course everything turns out OK in the end. The Inspector Flytrap series (Abrams, 2016 and 2017) was written by my swell husband, Tom Angleberger, and illustrated by me. Inspector Flytrap is a Venus flytrap who wants to be the greatest detective who ever lived. But he needs some help to make this happen. He he gets that help (though barely) from a goat named Nina, who pushes him around from mystery to mystery on a skateboard. The stories are wild and silly, and they were a joy to illustrate. I also created several one-page comics that are hopefully as gonzo as the stuff Tom came up with. Chuck and Woodchuck (Candlewick, 2016) is a quiet picture book about a girl named Caroline, a boy named Chuck, and a woodchuck named Woodchuck. Chuck very much would like to be friends with Caroline, but his shy nature makes it difficult for him to interact with her. Luckily, Woodchuck acts on his behalf and is able to facilitate the friendship. Crankee Doodle (Clarion, 2013). Tom Angleberger and I activated our Wonder Twin powers and came up with this nutty concoction. It asks the following question: What if Yankee Doodle really, really didn’t want to go to town? Tom Angleberger, right, and Cece Bell, left. 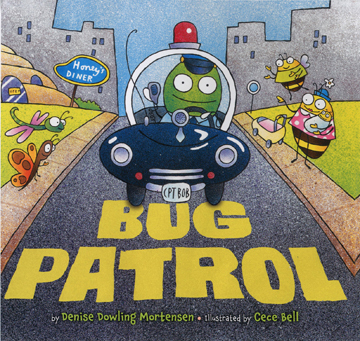 Bug Patrol (Clarion, 2013) is a picture book by Denise Dowling Mortensen. It’s the first picture book I’ve illustrated that was written by somebody else. Captain Bob is the bug policeman on patrol, reprimanding bugs of all sorts for various crimes and misdemeanors. Hopefully the illustrations match up to Ms Mortensen’s very fine rhymes. 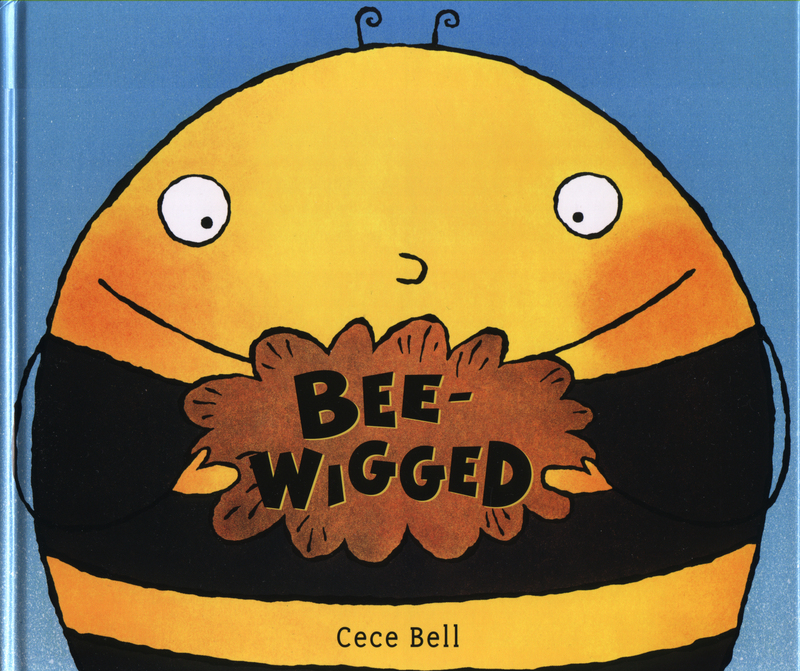 Bee-Wigged (Candlewick Press, 2008) is my favorite book of all the ones that I’ve published. 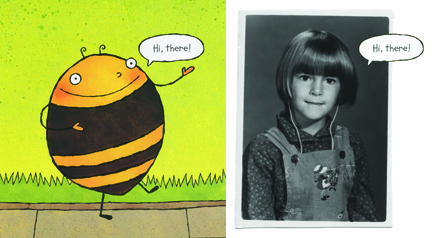 In a crazy way, it is autobiographical, because, like Jerry Bee, I am a wig-wearing child-sized bee who tries to radiate positive energy whenever possible. This book has a twist! And who doesn’t love a book with a twist? Itty Bitty (Candlewick Press, 2009). In this book, a tiny dog finds enormous bone and chews it out and makes it his home! And, of course, there is the Sock Monkey Series, which you can read about here. 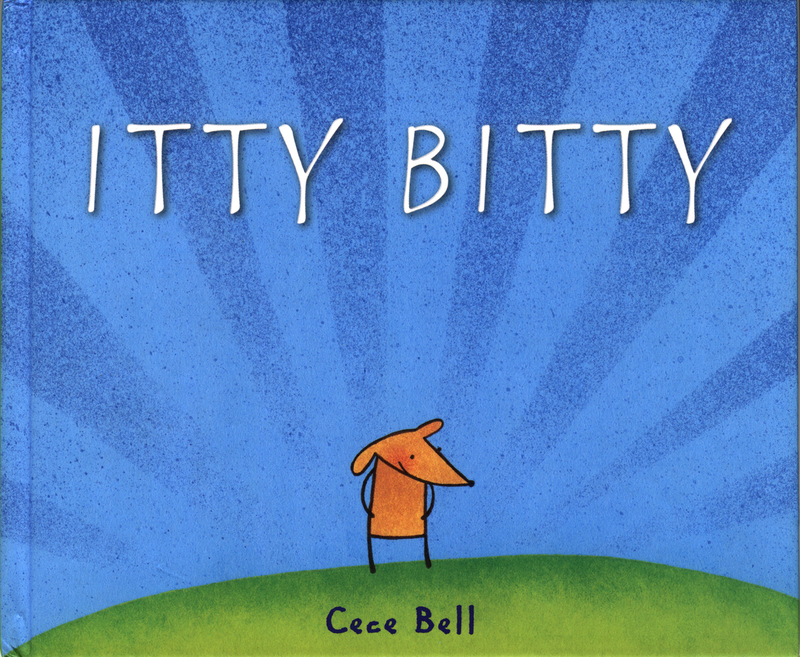 I picked up a copy of Itty Bitty at the library last month and my 3 year old loved it. I returned it and when he asked where it was, I told him we had to give it back to the library. He almost cried. Needless to say, we went back to the library and checked it out again. He absolutely loves reading it. He is a fan of Maisy, but I think Itty Bitty is his favorite book now. Thanks for a great book! I can’t wait to read more of your books to him! Thank you so much for writing! I hope your son didn’t actually cry, poor fella. I love Maisy, too, so that’s quite a compliment. Thanks again for writing! can you make and el deafo 2! Thank you so much for the gift of Jerry Bee-My 3 year old has just been diagnosed with high functioning autism and loves books-we got bee-wigged from the library and within a few days she was ‘reading’ it word perfect so we went out and bought a copy-when asked who her friends are by people she always says Jerry Bee-he is an inspiration to us all!Keep up the great writing! Hi Joanna and Esme! Thank you so very much for your kind note. I will cherish it! And how wonderful to get a note from folks in Ireland so close to St Patrick’s Day, at that. Please tell Esme that I hope that she will include me in her list of friends someday. And for now, I am glad and honored that Jerry Bee is her friend — that warms my heart. Send me an email sometime (cecebell@yahoo.com) so I can write you a more personal note. All good wishes to you!!! Thanks again for making my day. Hello! My nephew who is now four years old loves ‘Food Friends, Fun Foods that Go Together!’. He was one year old when he was first introduced to this book and until now he still loves it! I started reading the same book to my daughter when she was one year old and she has loves the book as well, she just turned 18 months 2 days ago! Your book is by far their favorite!!! 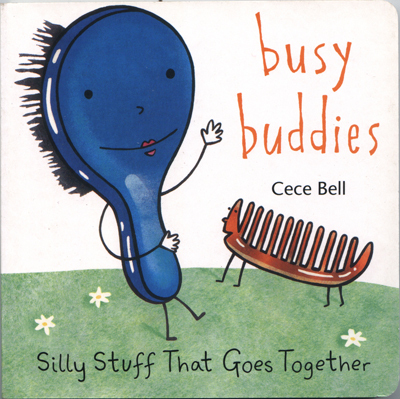 I’m going to try to find the companion book ‘Busy Buddies’ hopefully I’ll be able to find it! I’m unsure if I should buy another copy of the ‘Food Friends” my nephew and daughter has read it so much the spine cover of the book has come off! Thank you so much for writing these wonderful books!!!! Goodness, thanks for your VERY kind note, and I do apologize for being so late responding to you! I am so glad that your nephew and daughter enjoy the old Food Friends book; it’s been a good long while since I’ve heard mention of that old chestnut. I’m gonna send you an email r.e. Busy Buddies right now. Thanks again for your positive energy. Much appreciated. I heard your interview tonight on NPR and can’t wait to purchase El Deafo to read my 2 year old and 4 year old! Sold out fast on Amazon, I guess but I’ll find it. We have several people with hearing disabilities in our family, and are looking forward to learning about it through what looks like an adorable, witty story. (Mommy’s favorite kind to read them!) 😉 My daughter also has a large birthmark over a portion of her body so I’m always looking for books that teach how cool it is to be different from everyone else. Thanks to people who use their own life experience to help others, especially children. Helps make the world a better place, for sure. You gave a fantastic interview and are wished great success! Congratulations! Thank you for listening! I’m so glad you think that books like this one are helpful. You might be able to find the book at a local bookstore…and there are other online bookstores offering it, I think! I hope you’ll enjoy it if and when you find a copy of it. Thanks again for such a nice note. Please tell your kids that they are awesome! xoxo! A couple of weeks ago, I purchased “El Deafo” for my six year old daughter who loves books. On that day, I had gone into the bookstore for just myself but your cover and title immediately drew me in and your book is a huge hit in our household. She never puts it down. She takes it everywhere with her and together we learned about deafism. Looking forward to reading more of your work. Happy Holidays! Wow! Thank you so much for your nice note, Giovanna. Please tell your daughter thank you for reading the book. That means a lot. Hope your holidays were lovely…have a safe and happy 2015! Hi Cece! My 9 year old son who got your book el Deafo the other day is loving it so much that he is bummed there is no second part! You have two fans here! I reviewed your book on Amazon and posted a picture of him. Thanks for your wonderful book! I’m letting all my friends know about it! Aw, thank you so much for this! So much appreciated. Tell your son thanks for reading it…and thank YOU for reading it, too–and for the kind words on Amazon. Have a wonderful new year! Your note cracked me up! Thanks for reading the book, and for writing to me. xoxo! I just finished reading “El Deafo” with two of my four kids. We all loved it! Thank you for writing such an accessible and sympathetic story. It encouraged some really good discussions, and I loved the message! Keep up the good work! Hi Oliva! I’m looking forward to seeing you SOON! Thanks so much for reading my book. We will definitely have a great time on April Fool’s Day! XOXOX! Yep, it’s true! Thanks so much for reading the book! Our whole family loves your book El Deafo. My youngest daughter is using it to practice her reading. My oldest daughter says the drawings are really cute. I was looking for others books like yours but they don’t exist. It is such an original. Aw, thank you so much! You might want to try some of Raina Telgemeier’s books—-they are amazing. And there’s a new book called Rollergirl (by Victoria Jamieson) that I am really enjoying so much. Your kids might like these, too! Thanks so much for the positive energy! xoxox! Thank you! My 8 yr old lost her love for reading sometime last year. We’ve skimmed through countless books with no avail. I saw “El Deafo” at our local library and borrowed it immediately after reading the first couple pages. She absolutely LOVES it! She stayed up late reading it and woke up asking for it. Hearing her giggles and happiness while reading again is such a HUGE blessing! Thank you again! We can’t wait to check out your other books. Thank you so much for this heartwarming note! Hello Cece, I just purchased your book and its amazing i really hope everyone can be as cool as you i liked your book so much and its so popular in our school that people saw my book and wanted it imeadiently. Hopefully you will make a series and if you do i have an idea for it. You should make it about Mike Miller Falling in love with you and then at the end it was all a dream.As a conclusion i really liked your book thank you so much for writing it. Sicerly your friend, Madison W.
Thank you, Madison! I’m so glad you liked the book. Your idea for a sequel is really something! I love it. Thanks again for writing to me. xoxo! I love EL DEAFO by CeCe Bell. This is a true story about her childhood. CeCe lost her hearing when she was 4 years old and it was difficult for her to fit in at school and make new friends. Then, CeCe starts wearing the Phonic Ear, a heavy duty hearing aid that helps her hear her teacher everywhere in the school…including the bathroom! This is a graphic novel, so the author tells the story using both words and cute, creative, and detailed illustrations. She shows that being different can be hard but it’s always best to be yourself. I give this sweet, funny book 5 stars! Sophie, what a great review! Thank you so much for taking the time to read the book, to write this review, and to share it with me. You’re awesome! Hope you’re having a great start to school—-if it’s started up, that is. Best to you! Oh thank you for writing back to me. I am so excited that you liked it! School starts up next Monday and I will share El Deafo with my classmates. p.s. I also loved Rabbit & Robot The Sleepover! Thank you, Sophie! I’m working on another Rabbit & Robot right now! Have fun at school! Hi Cece, I recently read El Deafo with my niece and I am a 35 year old woman who is hard of hearing. What a wonderful book! I laughed and cried most of the way through it and it greatly improved my sense of humor about my own experiences of growing up with hearing loss. Thank you, thank you! Eve, thank you for reading the book and for writing to me, too. I’m so glad that the book resonated with you and even more, that it made you feel a little better about your own situation. Even though there are lots of frustrating things that happen when you can’t hear and understand, there are plenty of funny things that happen, too. Please say hi to your niece for me, and thank you again for reading! All my best to you. Thanks for all your sweet notes, Kayla. Hope you’re having a great day today! My son (8) loved your book…..and just to let you know its reached Wales…my son wants to know when the next one is due out. Hi there! WALES!?! That is so awesome. I hope I can cross the pond one of these days. I’ve always wanted to go to the UK. Just, wow. I’m so pleased that your son liked the book! I have no idea when the next one is due out, as I haven’t even begun it, though I have been thinking about it more and more. I’ve been busy trying to meet deadlines of other projects…slow but sure. Thank you so much for writing, and please tell your son hello for me! Librarian in Charlottesville here, and I just finished El Deafo. It’s such a beautiful thing to have stories like this one that are simultaneously funny and true, that inspire empathy, and give people the chance to read stories about others like them. Thanks for all that you do! Also, I became embarrassingly giddy when I found out that you and Tom Angleberger are married AND met at William and Mary, my alma mater. A superhero illustrator duo! Hi Hayley! Thanks so much for your kind note. Huzzah, W&M! I’ve sent you a longer email that might be a bit on the goofy side…be prepared! I really love your book El Deafo!!! I just finished reading it! It was cool how you showed you gym class and teacher. I was scared of my gym teacher when I started 6th grade but in seventh grade I loved my teacher! Now I’m in 8th grade but I can’t do gym class yet because I hurt my knee and I had to have crutches and all those things and now I can’t go back to gym intill October! Also the last month of my 7th grade year I had to sit out of gym class even though I was off crutches!! Well I just wanted to say that I really really really like your book El Deafo and I also like the part when your go over to mike millers house and fall in love with him. That’s happening to me right now and he is so so so so so so so so so so so cute!! I hope I can just talk to him like you talked to mike miller!!! Please respond as soon as you read this !!! Hi Paige! Thanks for writing to me, and especially thanks for reading the book. I’m so glad you have a good experience with your P.E. teacher, and I’m sorry that you hurt yourself and can’t do P.E. for a while. (I would have LOVED not doing P.E., ha ha!) Good luck with your crush. From the sounds of it, he is super-cute! All the best to you! I wanted to tell you about Joseph Taylor! He was my crush! I’m in choir this year! If I didn’t meet Joseph Taylor I wouldn’t be in choir! I wrote a book on wattpad about him it’s called I Fall In Love With Joseph Taylor! It’s a a out the story of us that never happened! But Joseph Taylor just lost his cuteness and I don’t like him anymore! My new crush is Preston Fox! His eyes are just so dreamy! He is so cute!!!! I just can’t stop thinking about him!! I will give you the link to my wattpad book when I am done with it! I loved this note so much! I totally want to see this book you’ve written about your crush. That sounds like a great book, for sure. xoxo! I read el deafo it is soo good! Thanks for writing it! Sophie, thank you so much for reading the book! Are you in Canada? Wow! I love Canada and have been to Prince Edward Island, as I am crazy about Anne of Green Gables… All my best to you! Cece can you make a book how you become a author?????? We got your book El Deafo in our hand three days ago from my two kids 3rd and 6th Grade book order, you cannot believed that once we started reading: as a grew up adult, I was fighting with my two kids to finish reading your book in the past three days and today’s Saturday dining at the restaurant. Is that silly? But we all very enjoy reading it!!!! It was such good book and detailed but very funny illustration such on people insight character , emotion like superpower. ( I am sure everyone wish has that superpower no matter what situation we have). I will highly recommend your book to my friends and kids. If there is chance it would be great that your book be translated into different language, and sell oversea to different country such as China where I grew up there with lots of great memories. For sure lots of people oversea will also enjoy your book and benefit from it. Very appreciated I had chance in my life ever read your book and get to know you, very awesome! Inger, thank you so much for such a heart-felt note. I am so glad that you enjoyed my book so much!!! I especially liked your insight about my parents. I try to remember—and emulate—their kindnesses often. Thanks so much to you and your kids for reading the book! That means so much to me. We got El Deafo out from our local Library some time ago and my daughter immediately identified with your story. We have since bought a copy and have spent many hours reading it together. Thank you so much for this amazing book. I was wondering if you have considered a large format edition for kids who struggle with the small print. Hi! Just letting you know that I’ve shared some of our correspondence with my editor. Hopefully we will figure out a book that’s easier to see and enjoy by more and more folks…thanks again for your constructive comments! Hi Cece! My name is Nora and I loved the book El Deafo! If you did not ever make it I don`t know what I would do with myself. p.s. I am 8. Hi Nora! I’m so glad that you have enjoyed El Deafo so much. I bet you would be totally fine if the book didn’t exist in the world–but I’m glad you like it enough to WANT it to exist in the world! Thanks for reading, and for writing to me, too. All the best to you! Hi Cece! I have read the book El deafo 4 or 5 times in a row! I am a fast reader. WOW! You really ARE a fast reader. Thank you so much for taking the time to read my book–that means a lot. Best to you! Hi, I’m Carissa. I’m 6 years old and in Grade 1. El Deafo is a good book. I’ve read it 5 times so far, sometimes on my own and sometimes with my Mom. I really liked the parts that happened in Miss Sinklemann’s class. I think you’re great! Hi Carissa! Thank you so much for reading my book. 5 times!?! That is AMAZING! I’m thrilled that you like it so much. All the best to you! My soon-to-be adopted daughter and I just finished reading El Deafo today, and I have to say that it is the cutest book ever with eye catching illustrations! Aeris, my 9 year old daughter, absolutely loves your story and understands and appreciates you being deaf well as your character. We will be looking into reading all of your books. Please nurture your talent and never stop doing what you do, you are quite a gem! Michaela, THANK YOU for such a kind note! I am so happy that you and your daughters enjoyed the book so much. That means the world to me. I hope you enjoy some of the others. They’re kinda wacky! Again, thank you for your support. I hope your Thanksgiving is a wonderful time for you and your growing family. All my best! Hi Rob! Thank you so much for your note! How exciting to find out that you are sharing the book with your students at the U of I. That is supercool. I’m thrilled to find out that your kids enjoy my books. That means the world to me. Tell them hi for me! Have a terrific holiday season! xoxo! Two days in and the college students are all loving El Deafo, although I had to explain to them why you were so excited about getting a Hostess Fruit Pie from your mom. (I’m guessing you enjoyed many a comic ad featuring heroes using Fruit Pies to defeat their enemies–but maybe you just loved them as a snack.) Happy holidays to you and your family as well! Hey Rob! I loooooooved Hostess Fruit Pies and that really is what my mom gave me that wretched day…it was just a nice coinky-dink that Hostess took up a lot of ad space in the old superhero comix. Thanks again for sharing my work—it means a lot! Have a lovely holiday season! xoxo! My 7-year old daughter absolutely loves El Deafo! I gave it to her as an early christmas present, and she would not put it down! I had to take her flashlight from her so she would not read it in bed, Ha! She truly related to the character and enjoyed the jokes and story immensely. She only has one request: El Deafo 2!!! Thank you for bringing her such joy. Hi Amanda! I am THRILLED that your daughter has enjoyed El Deafo so much–wow! And I love the image of a kid reading my book in bed with a flashlight…hoping to do an El Deafo 2 but your daughter will probably be in college by the time it comes out, ha ha! Have a wonderful new year, and thanks again for writing to me. xoxo! Cece when is there going to be another El Deafo 2 if there is one because I loved the first one! Aw, thank you Mohid! I’m so glad you liked the book! I am not so sure about a second one…have been so busy with other projects that I haven’t even begun on a second…though I’ve been thinking about it! xoxo! THANK YOU for reading it! Much appreciated. I am thrilled you enjoyed it! XOXO! My daughter(11) read El Deafo last summer(loved it) and my son(9) took it out of the library last week and is on chapter 14, round #2. This morning we were listening to Kids Place Live on the radio and they mentioned your new book, Rabbit and Robot. So, of course I had to come on to check it out, and what do I see? 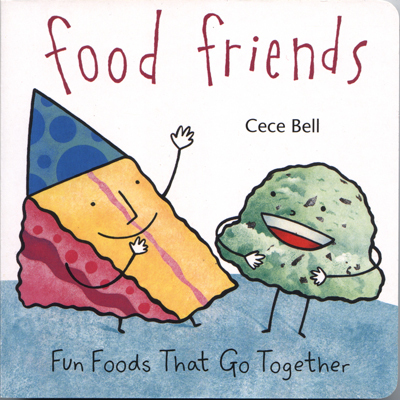 My daughter’s favorite book when she was little, Food Friends! We did not put together Food Friends and El Deafo…mostly because it’s packed away as a favorite book. The smile on E’s face when she put it together was priceless. It’s really nice when an author grows with the kids. We still talk Food Friends and with the kids I teach, we have letter buddies…all thanks to Food Friends. Hi Kerrie! This is so cool! I love it when folks don’t realize that the same person is behind different books that they’ve enjoyed. Your note made my day. The Rabbit & Robot you checked out has been out for some time…the new book is Rabbit & Robot & Ribbit, out in September! I hope you’ll enjoy it. Please thank your kids for reading my books, and especially thank your daughter for loving Food Friends. That means a lot. And so does the fact that you have letter buddies! Very cool. All my best to you and your kids and your students! xoxo! My 7 year old daughter Corinne and I just finished El Deafo. Her response, “I loved that!” She has now started over reading it from the beginning. This will definitely be our next bookstore purchase to stay on her shelf. Thank you! Come out to Southern California! We would love to go to a book signing! Wow! Please thank Corinne for reading the book–that is MUCH appreciated! I’ll be at Comic Con in San Diego in July…if I can wrangle a book signing at a nearby bookstore I’ll post that on my website. Thanks again for reading and for writing to me. Best to you both! Good morning!!!! Today my daughter had super hero day at school. And she has chosen to be El Deafo!!!! My daughter is 5 with severe to profound hearing loss. It seems to be progressive. We found your book last year and since then el Deafo has been her hero. Someone she can relate to. She attends a hearing school surrounded by hearing children and it’s nice to show her she’s not alone. She’s not the only one “different”. And she her self is a hero. We’re learning sign language and educating family, friends, and strangers about what it means to be Deaf or hard of hearing. And we’ve used your book as a tool. Thank you for being awesome. Wow wow wow. THANK YOU so much! Your daughter is clearly awesome, and I am honored that she chose to be El Deafo for Superhero Day! xoxo! Hi, Cece! My 3 daughters and I are thoroughly enjoying El Deafo. I have a 4 month old baby boy who is deaf and your book is giving us a glimpse into his world. My sister just bought copies for her inclusion classroom and she is reading it to her students. Thanks for sharing your story with all of us! Jill, thank you so much for your kind note! I bet your baby boy is adorable (and your daughters, too). I hope he is doing well! Please thank your sister for sharing the book with her class, too. All my best to you and your family! xoxo! Hi CeCe Bell, I am 7 years old and I am Henry’s friend Lucy. He wrote to you the other day. We are in the same class. My friend Ashtyn’s mom gave the book El Deafo to my teacher and she has been reading to our class. I like the book so much my dad bought it for me. I understand how CeCe feels I have a hearing loss and wear hearing aids. My teacher Mrs Jones uses a fm system for me. I just got a new pouch for the fm. I like your book so much because I feel the same way as the character CeCe does. I don’t like how Laura always bossed you around. The book has helped my classmates learn about my hearing loss and helped them understand me better. I just wanted to let you how much appreciate you and your book. Hi Lucy!!! Thank you so much for your nice note! I think it’s wonderful that you enjoyed my book so much–that means the world to me. I hope you like your FM system more than you dislike it. I didn’t like the way mine made me look, but eventually, I came to love it because it helped me learn, and I love learning new things. It also helped me do way better in school, that’s for sure! Your teacher sounds like an amazing teacher, and it’s so nice of her to help you and your classmates by sharing the book with you all. You’re awesome! Thank you again for your kindness. Best of luck in EVERYTHING you pursue! XOXOXOXOXO! And hello to Henry, too! Thanks for the kind comments, Angie! Hope you’re well! Cece- Hello, my name is Céide (sounds like Kadie) and I’m 8 years old and I live in Montana. I am wondering if you will make El Deafo 2? El Deafo is a great book and I have read it many, many times since I got it at Christmas!! Reading El Deafo makes me happy as ever and I look forward to hopefully reading its sequel someday! Hi Céide! Thanks so much for your note. I am thrilled that you have been enjoying my book so much! I think about a sequel all the time but so far I haven’t put anything down on paper. Maybe someday I will get my act together and do it! Thank you again for reading the book, and for your kind note. All the best to you and your family! xoxo! I picked up “El Deafo” for my 8 year old daughter at MoCCA Fest, thinking she might enjoy a story with a girl hero. Unfortunately she is very squeamish about all things health or body related, so she couldn’t even get past the beginning. However, her 6 year old brother picked it up and he loves it. I think he’s read it at least once every day since I brought it home! Hi Boris! Thank you so much for your letter–it cracked me up! I totally understand how some of the stuff at the beginning could be difficult for an already-squeamish kid to read, so please let your daughter know that no feelings were hurt whatsoever! I’m thrilled that your son has enjoyed it so much. He must not be as squeamish if he’s reading it every day! Thank you for picking up the book at MoCCA and for sharing it with your kids. Means a lot. Best to you and please tell both your kids hi for me! xoxo! I loved El Deafo so much I read it 7 times. I love it every time. I hope you write more books because it would mean I get to read books like El Deafo all the time. Hi Cece I read “El Deafo” and I loved it. We had it for this event at my school and the name of the event was “battle of the books” and guess what I read it in 30 minutes! I can’t believe it myself. Thank you so much for your note! And thanks for reading my book. 30 minutes is a record! I’m so pleased you enjoyed the book. I hope you have a great summer! I love your books, and write now I am writing about it in English. It really made me think outside the box, and look at it differently at things. Thank you, Maire! I’m so glad that you enjoyed my book enough to write about it in English. That’s the big time for me! Hope the assignment goes well for you. Have a terrific summer! xoxo! My six and eight year old boys LOVE I Yam a Donkey!! We all laughed hysterically!!! Hi Kris! I am so thrilled that your boys loved I YAM A DONKEY! That makes my day. I hope you’ve been having a great summer and that good grammar is (or isn’t, if you don’t want it to be) in your future… xoxox! And big hellos to your boys! Hi Cece I love your book El Defo it is my favorite book ever. I read it over and over again before I go to sleep at night. Hi cece,how are you ? I’m doing fine. I like your book rabbit and robot. Cowboy jack rabbit. Tell tom hi!!!!!! I am the librarian for a Pre-K through 4th grade elementary school in Mansfield, Texas. Your book, I Yam a Donkey, was chosen as one of the “Sweet 16” for our March Book Madness. I just wanted to let you know that even though very few students had read this book before, you beat out a Fly Guy book, Pete the Cat, and The Pigeon Needs a Bath to make it to the championship game this week! Thank you for a great book, and for being an inspiration! The mane characters (all animals) are: a flytrap Inspector Detective Agency named Flytrap (the narrator) who’s a genius; a goat named Nina the Goat (who eats EVERYTHING! ); and the President of the United States, Horse G. Horse (who’s a horse***, of course) who lives in the White House. We see a statue of Julius Caesar with Inspector Flytrap and eaten by Nina the Goat. Does Nina the Goat go to Little Caesar? Obviously she does! She eats EVERYTHING! This book is a PICKLE of laughs! Kudos to the author and illustrator.